You will need to sign up to have one of your bins cleaned on a monthly basis for a minimum term of 12 months. Bins can quickly become dirty, smelly and turn into a breeding ground for germs and bacteria. Most councils, including Luton District Council, operate on a two weekly collection cycle meaning disposed waste and rubbish spends up to 14 days festering in your bins breeding bacteria and creating unpleasant odours. Bins with waste often attract pests which bring additional germs and some of which are dangerous to human health. Just imagine the bacteria that breeds on the surface of your bins let alone inside! Finally, your bin comes into contact with the waste collection vehicle every time it is emptied, exposing it to yet more germs, bacteria and dirt. That is why waste bins have to be cleaned regularly. Shouldn’t bin cleaning be the councils responsibility? You would clean your house even if it belongs to council, or the car you drive even if it is a company car. It is the same with your bin. It is provided as a place to store your waste outside of your home until it is collected by the council. Why wouldn’t I clean them myself? If you have a water supply, a hose and cleaning equipment, you would probably think to yourself: ‘I’ll do this myself’. However It always comes down to time and convenience. We have specialised pressure washing equipment and detergents to do the job properly and plenty of experience to make sure your bins are always left spotless. Currently we operate in the Luton area only. However the Wheelie Clean service is expanding and we also carry out commercial wheelie bin cleaning into London and St Albans areas. Please contact us and we will let you know what can be done. What type of bins do you clean? 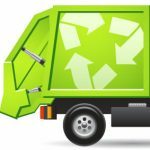 We clean all types of wheelie bin, from landfill, recycling, garden, and even large commercial wheelie bins. When and how often will my bin be cleaned? We offer a 4 weekly contract taken on a 12 month subscription. Also there is a one off option available where no contract is required. We recommend that your bins should be cleaned every 4 weeks. This is especially important for bins containing food waste. This is the optimum cleaning cycle to maintain a fresh, safe and odourless bin. If you have any special requirements, please get in contact as we will always try to accommodate your needs if we can. Depending on the service you choose getting your wheelie bin cleaned all year-round can be very cost effective. Contact us to discuss terms and pricing for the commercial bin 12 month contract. How do I register to get my bin cleaned? We accept payment by debit/credit card as well as cash. The majority of our customers prefer to pay in advance for the whole year however we are quite flexible and can agree on a quarterly or monthly payment plan. Yes, we do. The most efficient and economic service we can offer is based on a regular cleaning schedule however we know that there are cases where a one-off service would be more appropriate. No, you do not have to be in when your bin is cleaned. Just let us know where you will leave your bin e.g. at the kerbside, for the cleaning team. They will put it back in the same place, clean and smelling fresh! Do I have to supply my own water? No, we supply everything necessary to clean the bin. We carry our own water supply and detergents. How do you clean bins? Our cleaning team will arrive in a van with all necessary equipment, water and detergents. We will clean it, rinse, wash with a substance with deodorising properties and dry out. Absolutely not. All debris from the bin and generated waste water during cleaning will be contained in tanks on the cleaning vehicles. These tanks are only emptied at specific licensed points approved by local authorities and water companies under Environment Agency rules. Yes, it will. However please be aware that there are some rare occasions where the waste is not of the usual household type or has been disposed of in certain way that it has damaged the bin. Substances such as paint, glue, tar, burn residue cannot be removed using our system. If you have any other questions relating to our services that we have not covered above, or you need more information, then please don’t hesitate to contact us.